Live-streaming operations seems to be a hot thing to do these days. Whether it be operations, pvp, flashpoints or even just leveling, people seem to enjoy watching other people play when they cannot. It’s always interesting to see how others play their characters and maybe learn some new tricks or strategies when seeing an encounter. Of course, with the coming of the new operation there will be plenty of streaming going on. Bioware said in their official podcast that they would be watching any livestreams of the PTS so get ready to go live! By far, PVP seems to be the most popular types of streams that can be found which is probably due to its dynamic play and the ease of jumping in an out of matches. Operations are a little harder to find since you have to be watching whenever the group is running it. Still, they are out there and, if you subscribe to the channels, you can be notified whenever those channels go live. Hopefully, Bioware really will be out there and watching so they can take notes on how we, the players, take to their encounters. You’ll need two things in order to start livestreaming your games. The first is streaming software and the second is a place to post your stream. The first thing isto find your corner of the internet to put up your video. I recommend twitch.tv, a free site where you can watch TONS of gamers playing anything from Minecraft to Battlefield 3 with everything in between. By signing up for that site, you’ll have the ability to post your own streams. 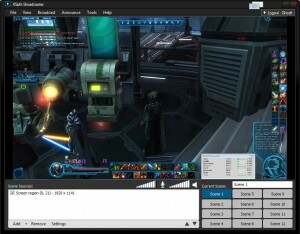 The software that most people who stream live use is called Xsplit which can be downloaded directly from their site. You can register for their site and create an account to use their free version but, if you like the service, you can subscribe which will allow you to use extra features, such as higher quality video streams, more options on frames per second and the ability to stream directly from an application rather than a screen region. Remember that you are broadcasting live and what you say out there will be seen by anyone who is viewing your channel. Be mindful in what you say as your audience may not care to hear it. Also, be wary of what you have going on in your chat channel. If you stream at a high enough quality then that can be read as well. Fortunately, Xsplit does have the ability to black out sections of the screen so you may want to take advantage of that feature if your guild chat tends to be risque. That’s really all there is to it! From here you can customize your twitch.tv page to show past videos, what you are currently streaming, share your footage and chat with the people viewing your stream. Speaking of which, feel free to subscribe to my own twitch.tv channel and you’ll get emails whenever I go live with an operation stream. Once the PTS is released, I’ll also be streaming the new operation so stay tuned in!